It was a Friday. So yeah, of course it was going to be awesome! Well, mostly. Work was a bit meh, which it has been, on and off. But the most awesome part about Fridays is that it's the end of the working week, so that's always cause for celebration! Next, it was to the video shop to pick out something to watch. Our original plan had been to go to the movies, but I was tired and keen for a quiet night, so we picked out Saving Mr Banks (uh, that was me... but I'd heard it was really good! ), which we watched that night, and The Wolf of Wall Street, which waited until Day 64. Sooo.... the Kiwi passed out on the couch half way through Saving Mr Banks. But in the first place, he has a habit of falling asleep during movies, and in the second place, as it turns out, he hasn't actually seen Mary Poppins (seriously! I didn't realise that was possible!!! ), so I don't think that was really a true reflection on the movie's awesomeness. I personally found it to be quite interesting, and may have sung along and cried a little (hah, so it's a good thing The Kiwi was asleep). Plus of course it had the ever-awesome Emma Thompson and Tom Hanks in it. Saturday! Whoohoo! Mind you, it was a pretty miserable day. But it began with a nice sleep in, and an awesome cooked breakfast, and a trip to Ikea for a cushion for the stool I sit on at The Kiwi's house - I've been getting bruises on the backs of my legs from it. I"m such a special little snowflake. After Ikea we headed to the Asian supermarket on Victoria Street to pick up some ingredients for the Tom Kha Gai I had decided to make for dinner. I'd actually been mulling over it since I had the same dish on Tuesday night, and - spoiler alert - mine was waaaaay better. I was also totally right about the flavours not being quite right - I used the pretty darned genuine recipe book from the cooking school I attended in Thailand, and, lo and behold, kaffir lime was in it. Just like I thought! As soon as my camera has been fixed I'll make it again and take some photos and post the recipe for you. Oh! And I got a little teapot from the Asian supermarket, which of course means that I spend even more time drinking tea than I already did. I didn't know that was possible, but here we are. Perhaps next weekend I'll bake some kind of awesome cake to go with it... and actually post a recipe for the first time in a gazillion years. Sorry I've been so neglectful about that, y'all. Sunday! Whoohoo! Unfortunately I woke up quite suddenly, only 6 hours after I had gone to sleep, and was unable to get back to sleep. I spent two hours being annoyed about that before I got out of bed and realised what a beautiful day it was. After brekkie I mucked around a bit and FINALLY cleaned out my laptop bag. I was a bit stunned at how much junk I threw away from it, actually. Including (but not limited to) a broken sachet of chicken noodle soup... which means that the long-lost set of earphones that have been kicking around the bottom of my bag actually smell like chicken noodle soup. Delicious, but really, really odd! 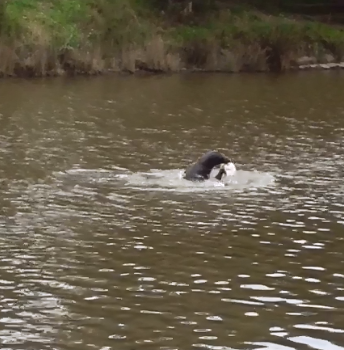 Yep, that's a seal, catching fish and frolicking. 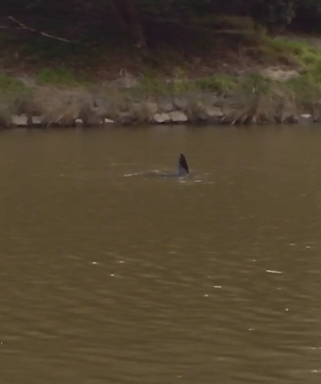 In the Yarra River. In Hawthorn!!! HOW FRIGGING AWESOME IS THAT??!!! 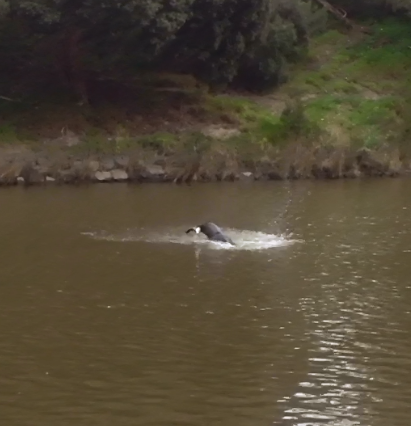 I called Wildlife Victoria and they got the sealkeeper from Melbourne Zoo to call me, and he said that it's not unheard of for seals to be found that far upstream, but it is pretty rare. He said they'd go have a look for it on Monday. I'm a bit worried about the poor thing being so far from home, but he seemed happy enough. Hopefully he stays happy and goes home soon! UPDATE #2: Both Channel 7 and Channel 9 want my footage so they can show it on the news tonight. Yep, definitely famous now! Aaaanyway, once the excitement of the seal spotting had died down, we kept walking, and I decided that it was time that I hardened up and tried a little jog. It was abysmal enough an effort to send The Kiwi on ahead, and for me to have only run a total of about 500m, but I guess you've got to start somewhere. I was, however, pleasantly suprised by how well my little sprint (hah, well, it was sprinting for me!) went at the end. So it wasn't all bad, and it was pretty awesome having company and knowing someone was there if I needed them. And now I have something to build on, which is always good. The afternoon involved a trip to Kathmandu (or Kathman-don't, as I call them) to pick up some new shorts for my impending trip to India, seeing as I have prodigiously outgrown my old ones (well, I guess that really just means I've gained a bit of weight...). I ended up with a pair of shorts, a skirt and two shirts, so it was fairly successful. It was pretty awesome that I paid 1/4 price, but I couldn't wrap my head around the fact the people sometimes pay full price for this stuff. Seriously, what the hell are they thinking?? An evening spent watching The Wolf of Wall Street (The Kiwi stayed awake for that one!) and eating a pretty tasty Tandoori chicken salad for dinner was an awesome end to an awesome weekend that was very much too short.